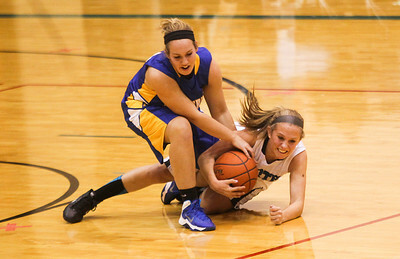 Sarah Nader- snader@shawmedia.com Johnsburg's Erika Szramek (left) and Woodstock North's Jenifer Crain fight for control of the ball during the second quarter of Friday's game in Woodstock December 6, 2013. Johsnburg won, 43-38. Sarah Nader- snader@shawmedia.com Woodstock North's Jenifer Crain brings the ball down court during the third quarter of Friday's game against Johnsburg in Woodstock December 6, 2013. Johsnburg won, 43-38. Sarah Nader- snader@shawmedia.com Johnsburg's Trace Chase shoots over Woodstock North's Haley Ahr during the third quarter of Friday's game in Woodstock December 6, 2013. 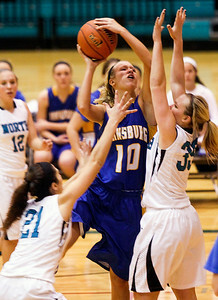 Johsnburg won, 43-38. Sarah Nader- snader@shawmedia.com Johnsburg's Kayla Toussaint (center) shoots during the first quarter of Friday's game against Woodstock North in Woodstock December 6, 2013. Johsnburg won, 43-38. Woodstock North's Jenifer Crain brings the ball down court during the third quarter of Friday's game against Johnsburg in Woodstock December 6, 2013. 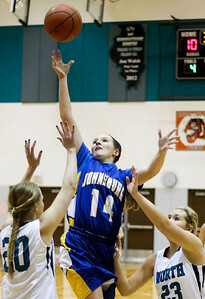 Johsnburg won, 43-38.